The closing date for submissions on the Unitary Plan is coming up fast, with the cut off being 5pm this Friday. Compared to the major publicity that erupted around the first stage things have been very quiet so far. However it is still imperative that positive submissions are lodged in support of the good parts of the plan, and also suggesting improvements. Submissions can be made on the Auckland Council site here and the Council also have several documents that help submitters write their submissions. Note as this is a more legalistic process submitters are encourage to reference parts of the Unitary Plan they would like to keep or amend specifically and they have produced a guide to help with that as well. One of my other roles is I am one of the writers of the Generation Zero submission, so each day this week I will write a post about the main points we are submitting on, these are based on the 6 main points of our quick submission form from May last year. I will also include the provision numbers to help readers identify the correct areas in their submission too. One of the major issues that came up was around Minimum Parking Requirements. There have been numerous posts on this blog outlining the negative impact these requirements impose on housing affordability, urban design and housing choice. The Draft Unitary Plan made some good strides in this area and the Notified Plan was improved further still. Under the old District Plans, Minimum Parking Requirements existed everywhere apart from the CBD. In the notified Unitary Plan, Minimum Parking Requirements can be found in PART 3 – REGIONAL AND DISTRICT RULES»Chapter H: Auckland-wide rules»1 Infrastructure»1.2 Transport»3. Development controls»3.2 Number of parking and loading spaces. Minimum Parking Rates have been removed from the City Fringe Zone (Parnell, Ponsonby, Newmarket, Newton), Metropolitan Centre, Town and Local Centre (except Rural Town Centres), Mixed Use, Terrace Housing and Apartment Building Zones. Instead of Minimum Parking Requirements, Maximum Parking Requirements apply instead. This a huge improvement from the existing rules and will allow developments to proceed that are more affordable, have better urban design qualities and better fit the needs of tenants in this area, so this should be supported. However on the downside Minimum Parking Requirements still exist in the Mixed Housing Urban and Suburban Zones. These are the proposed rules in the notified Unitary Plan. The rules are still much too strict in these Mixed Housing areas where major intensification is planned to take place. No minimums should apply in these areas. Minimum Parking Requirements also apply across the city (outside the zones identified above) for a range of activities such as Offices and Education facilities. There are still a few especially strange ones in there too. The favourite crazy example is of course Taverns, which still require 1 park for every 20m2 GFA! Ideally these Minimum Parking Requirements should be removed as well. In car dependent areas of town developers will still provide carparks where necessary, however over time as public transport improves, developments will be able to occur with less parking. If you are interested in writing a more detailed submission on parking requirements, an excellent report was produced for Auckland Council by consultants MRCagney outlining the costs of Minimum Parking Requirements, and this is included as part of the Section 32 reports which provide the justification for proposed Unitary Plan provisions. Interestingly enough this report recommends against Minimum Parking Requirements in the Mixed Housing Zone, and also includes the Costs of Minimum Parking Requirements in centers such as Takapuna and Dominion Road outweighed the benefits by 6 to 1. How do you “let people decide” when the layout of a new suburb or development needs to be determined at the outset, before selling the sections? Will you be leaving enough space on each property for parking to be retrofitted at a later date by any purchasers wanting it? If not, then it’s not a case of letting people decide, but rather it’s taking away the choice and forcing one position that can’t be changed. Remember, parking minimums are about choice. It doesn’t force anyone to have a car or two, it just ensures you always have the choice. Take away the parking spaces, take away the choice. Wrong. Minimums are about removing choice – you have to include the minimum parking spaces because those are the rules. Without minimums you have the choice to either include parking or not (or include less than the minimums). Under current rules, if you want to build or buy a house/apartment etc without the parking, you simply can’t because they are not allowed (you are forced to have the space no matter what you want). Without minimums you can choose to build or buy a house without the parking, with less parking, with more parking whatever. This is more choice not less. I don’t see how removing minimums creates choice. On the contrary it takes away choice. Parking = can have a car or not have a car (choice). No parking = can’t have a car (no choice). I agree with Tim, space is space. Have the driveway entrance and allocate the parking space, but relax the rules around how you use it. But don’t remove the choice, that’s just stupid, especially in a city where the majority will always drive. How does it take away choice? Want to have car = buy/rent place with parking. Don’t want to have car = buy/rent place with parking. If you live in a place with no parking and decide you want a car move to a place with parking. Want to have a car = buy/rent place with parking. Don’t want to have a car = too bad for you loser! Don’t want to have car = buy/rent place without parking. Don’t want to have a car = too bad for you loser! You still have to pay for the parking place. Actually: I don’t think we should have to build the crossing or driveway at day one. Potentially another sunk cost enforced on purchasers and ratepayers where it may not be desired at all. And every driveway is of course more lost parking space on-street; zero sum game, until required on site numbers go north. The city already allows retrospective alterations to happen every day of the week, no issue with doing it in retrospect at relatively little additional cost. As long as the street is robustly designed with flexibility in mind it is all doable. Removing minimums improves choice because it allows property owners, developers, redevelopers and renovators to choose with more freedom how they allocate their private property between stabling cars and other uses. Future buyers, if they don’t like the choices a seller has made, remain free to choose a different property, as they always have been. Observing buyers’ preferences will influence developers to provide an appropriate mix of with/without parking developments. Space is space. Use it for a building or parking, it’s up to the owner. No rules needed. Have a building, want to turn it over to parking, up to you. Exactly, without minimums you are free to use the space for parking, a bigger living space, bigger open space whatever you want. With minimums you are forced to use it for parking no matter what. If you want parking include it when you build or if you aren’t building buy a place with parking – there will still be plenty of properties built with loads of parking. But without parking minimums you will also have the option of building or buying a property without parking if you don’t want or need it. Spurious argument. I’d love a hot tub. Shall we have a regulation that forces every dwelling in Auckland to have a hot tub installed by law, just in case some time in the future I happen to be foolish enough buy a house that a) doesn’t already have a hot tub, and b) hasn’t been designed to add a hot tub and c) has no space to modify it to add a hot tub? Of corse not. We should let people decide if they want their own hot tub or not, and those that want one can chose their dwelling based on whether it has one or can add one. If people want hot tubs then developers will build them and home owners will fit them. Absolutely zero justification to force everyone to have one. Do NOT hassle minimum hot tub requirements! The major difference here being that there aren’t thousands of FREE hot tubs provided by the city all over the streets around your house, should you be so unfortunate to have ended up in a place without one. Note the parking overlay for the city fringe areas (which proposes to take away minimum parking requirements) does not include Ponsonby – but does include St Marys Bay and Freemans Bay. Freemans Bay is one of Auckland’s oldest suburbs with closely developed stand-alone housing on small sites, with minimal yards, and limited or no provision for off-street parking. Aside from the current commuter parking congestion, there is limited street parking for residents. Freemans Bay is an old suburb and many residents have been here for decades. Removal of MPRs in this area will have a significant impact on independent elderly and young families as new buildings without carparking force more cars on the street, further limiting independence. The separation of the MPR discussion from Auckland Transport’s regional wide parking strategy is not sensible and any consideration for change in ratios should be considered after the strategy is implemented and tested – it is possible that process could result in even fewer on street carpark spaces. The arguments presented for eliminating MPRs relate to commuters and the commercial environment and there is no research showing their implementation in a tiny character suburb with narrow streets and limited land plots, and what the economic and social impact of this is. Parking strategy first! You’re right the City Fringe doesn’t include anywhere west of the Ponsonby Road shops, but does include the shops themselves and areas to the east of Ponsonby Road. Part of the reason for the character of St Marys Bay and Freemans Bay is the lack of off street parking, which is exactly one of our arguments. Suburbs that have a high level of character were built without minimum parking requirements. Minimum car-parking requirements are much mroe about residential development than commuters, parking requirements end up dictating the form of development, with ugly street level carparks or expensive excavated carparks, and also all open space being sealed for parking. Struggle to see how MPR’s will affect independence, this area is well served by public transport with the Link every 10 minutes and numerous other services. Connections across the region are more of an issue, but again note this discussion should take place in regards to the public transport of tomorrow, not of today. I think many people who move here will know of parking issues, and many people who live in proximity to the city will be happy to live car free. Note 25% of households in Waitemata Local Board area have no car. Also note that much of St Marys Bay and Freemans Bay is zoned Single House, which means no new developments allowed. I am sympathetic about commuters using local streets to park and walk/ride though, again I hope much improved public transport will help to reduce this issue, but would also like to hear about other potential solutions. Indeed, somewhat strange argument that we should enforce MPRs to avoid potentially upsetting people who enjoy a neighbourhood and housing type whose very value is based around not forcing everyone to provide driveways and carports and garages all along the street. Lets get rid of them and allow anyone who wants to to live that way. If you don’t want to then fine, you can do the alternative too. 2. time limits for people without a resident’s permit, to get rid of the CBD parking overflow. 3. possibility of developing small communal carparks in appropriate locations arond the suburbs, whether commercially or by the council. ** This would allow the ratio of parking to dwellings to respond to demand better – rather than forcing everyone to have a space that many may not want. ‘X per dwelling’ blanket minimums are an inflexible, overdetermined response (in plain language, using a sledgehammer to crack a nut), and have awful effects on the general urban amenity, as many others have noted. As well, in this sort of area one kerb crossover to make a new offstreet space takes away almost one kerbside space, for very little net gain. ** for example, if the developer of an apartment block finds it profitable to build a basement carpark bigger than needed for the residents, and rent out the spare spaces, why not let them? It’s out of the way visually and minimises the loss of kerbside parking at the crossover. I believe that given choice most people will make a reasonable job of optimising. If you remove the minimum then the market can dictate the value of a house with parking vs the value of a house without. That is going to be an efficient result. The really really dumb approach is to introduce maximum parking rates on residential units. It limits choice, creates onstreet issues and doesnt mean less traffic on the road. For example if you dont have a carpark and park on a P120 after 6pm then you will need to move your car the next morning. You will be compelled to use it! Second if you have only one space per unit in town centres then families with two cars won’t buy in a centre where they can choose to leave their car in their spaces and use the bus. Again they are incentivised to drive. Carspaces don’t generate traffic but daft maximium parking rules can. I think this is fairly bizarre reasoning. If this supposed family with two cars is using the bus everyday why would they pay for two cars to sit around all day? Why can’t they get by with one car? Surely this is a more efficient, get rid of the useless car that just sits around all day and only have the one that they really need. How are they incentivised to drive? If they really need two cars then they must be driving them everyday – they can’t be driving the car and taking the bus at the same time. Imagine a household with three adults, they might be a family or they might be flatmates. Each wants a car because believe it or not some people like cars and use them for trips that are not even work related. If the parking rules limit housing in centres to 1 parking space then they will buy or rent elsewhere and have an incentive to drive in the peak hour. Ideally they might live in a town centre and all three might leave their car in their own space and use a bus or train. Of course that would rely on people accepting that they are grown ups and are capable of making their own choices. Alternatively we can say “wouldn’t the world be better if a few sensible people made all the decisions” (not exact quote but close to Fred Hayek in the Road to Serfdom. He argued this is how all totalitarianism starts out). Anyway my point is taking away someones ability to park in a town centre flat means they will probably just live outside of the town centre. It is a sorting mechanism not a parking causes traffic effect. Personally I don’t agree with maximums, except perhaps in very specific situations where you are trying to manage the look of some historical neighbourhood or something like that. Remove the regulations I say, let people decide and self-sort, let the market respond. Couldn’t agree more. Sometimes rules are needed to avoid a particularly dreadful outcome but more often than not the rule creates worse outcomes than letting people choose. For example it makes sense to prevent a tin can factory going in next to an apartment but do we really need to tell each other how many cars you should be parking on your site? Personally I think maximums are unnecessary but I still don’t understand how they would incentivise driving. There are and will be plenty of opportunity to commute at peak hours by PT for people living outside of town centres. So your families/flatmates who want two, three or more cars can live outside town centres and leave their cars at home while the commute to work. It is probably the best place for them to live and probably where the vast majority of them will choose to live anyway. Where is the extra driving coming from? The idea behind intensified town centres is that they will be dense enough for frequent off-peak PT and have plenty of local services. This will provide the opportunity for residents to choose a lifestyle where they don’t have multiple cars and use PT for a lot of both off-peak and peak travel. This choice is not really available in Auckland at the moment. If you start from the assumption that every single person will always have their own personal car, regardless of where and how they chose to live, then the logical conclusion is that they will all be forced to park on the street overnight and drive away during the day. Takes a bit of an assumption though. Ok the maximum parking rule assumes the market wants more parking than that. Otherwise the rule wouldnt be needed. Why does the market demand more? Because people want to own a car- not much of an assumption really is it. Second the extra driving happens because those households with many cars are pushed to houses outside the town centres where PT will be best in the peak. If your choice is a first class car ride or second class PT which do you think they will opt for? The maximum rules are based on the notion that people dont substitute, a lot of planners think that but almost no economists or engineers believe that. It comes down to do you want everyone to have the option of living in a town centre and using PT at least for their commute or do you want to set rules that encourage only elderly people and some anti-car numpties into town centres? I don’t think maximum rules are needed so we agree there. Mind you in my case it’s not really because I think they will cause many negative impacts but rather that I don’t think the market will want more parking than they stipulate. There may be a bit of extra parking built initially but as soon as developers realise that people buying in town centres don’t want or need heaps of parking they will be quick to only include what is needed (which will be well below the maximums). I don’t think removing the maximums would hurt either. Giving people the option of paying a bit more for a residence in a town centre with more parking seems fine to me. What I really disagree with you on are that people would be pushed into cars by there being low amounts of parking in town centres (no matter whether the low amount of parking it is market-driven or rule-driven). The main difference in PT quality between town centres and many, many other parts of Auckland will be in off-peak services. Peak PT services outside many town centres is already good in many places and will improve even more in the future. So there will be plenty of opportunity for people who want to have lots of cars and have been “pushed” out of town centre to still have access to “first class” PT at peak times for their commutes. So while there may be some arguments for removing the maximums (though pretty marginal ones in my opinion), I really don’t think saying that they would push people into cars is a valid one. Anti-car numpties? It is not zero car parking in town centres just less car parks. Plenty of people living there will have cars, just not every single adult. I understand your point VLee (and you expressed more politely than I did, I am sitting in a very hot home office so apologies for grumpiness). Most households will probably be more than happy with the number of spaces they can have. But some might have a boat or more than 2 cars and the rule will target them and ensure they dont buy in a town centre. It perhaps wont push them to use their car but it will make sure they dont get the benefit of increased PT opportunities. Perhaps it is the households that make the most trips that we should encourage into town centres as the biggest gain is getting them to use PT for some. By definition a car space at your house is not a generator of traffic as it is somewhere to leave your car while you use PT or walk somewhere. Some people might wish to own one less car but that perhaps is unlikely if you are flatmates and even a family might still want more cars simply because of the number of off peak trips that you make to shops, sports fields music etc. But you understand that is a choice to own two cars and a boat. And maybe not the best choice if you want to live in the inner city of a metropolis of 1.5m people. Maybe one of the many autodependent suburbs or small cities in NZ would be better. Those people are currently well provided for and find it fairly easy to live in Auckland. Who dont find it easy are real urban peopel who want to live without a car in a vibrant walkable/cycle friendly area. So that is what the plan needs to create. Or you keep your boat in a storage yard, where land is cheaper and it’s probably closer to the boat ramp anyway. Maybe you share a car with your flat mate, or catch PT to sports practice. I’ve done all those things actually, not hard where you have a reasonable PT network like the New Network in place. If people want to catch PT to commute but own a car each to drive for all their other trips then there are plenty of other zones and typologies for that. Almost all of Auckland as it were. So yes, maybe the people who want a car each and room for a boat do get effectively excluded from town centres, and find living two blocks over a lot more convenient. “But you understand that is a choice to own two cars and a boat. And maybe not the best choice if you want to live in the inner city of a metropolis of 1.5m people. Maybe one of the many autodependent suburbs or small cities in NZ would be better.” Goosoid that is exactly my point the rule will work as a sorting mechanism not the travel demand measure it is claimed to be. It will allow your “real” urban people to live in a town centre. But maybe these are people who by their nature were more likely to use the bus or bike in any case. Again there is no transport advantage of having the rule just a selection mechanism. First, I think there is a valid issue that Council are tackling with the maximums. That is, how an authority that makes major public infrastructure investments in making centres better (happy to expand what “better” might be) can deter landowners from undermining that public investment by underutilising land. I’d be interested to hear whether you agree with that principle? Doubtless Libertarians will have a problem with that, but they also probably won’t be in a hurry to surrender Council investment in their ‘hood. Parking is a critical issue for centres; it’s easy to kill a centre by putting too much in. There are plenty of examples in posts on this blog over the years. However, It is worth asking the question of whether it is the best tool to avoid excessive or damaging parking. Maximums are at least simple to understand and low cost to administer, compared to assessments of traffic generation etc. I’m open to hearing other options. You suggest minimums will deter multiple car households from living in centres. That logic does not stand up; given the large quantity of parking in many centres you can often often just lease a space near by. Around the city centre in particular there are lots of options on flexible terms. Unbundled parking is far better than dedicated for so many reasons, potentially catering for the same number of car movements with less land take. Your point about undermining PT investment, nothing will undermine it better than if people choose to develop outside of town centres because they prefer the rules there. Instead of the poached egg model of town centres we will get a swiss cheese model. I accept that a lot of people will be happy with limited parking-but you dont need a maximum rule to satisfy them. You just need to get rid of the minimum. I fully accept that parking often works better when it is centralised or provided in one area near activities rather than each shop having three spaces and a driveway but that is not necesarily the case with residential where people want certainty and want to know when they buy or lease their flat that they have sufficent parking for their needs and it is close by. My point stands, maximums won’t affect most people the rule will be irrelevant to them (so probably not needed). The only real impact will be a sorting mechanism that makes sure those with lots of cars who presumably need to travel more wont buy in centres. Despite these high travellers being the very best people to offer high levels of PT to. The rule will select residents for town centres but probably not have any real impact on transport. JohnP – I apoplogise, I realise above that you were just arguing against parking maximums and I agree with you. However, I still think it is a mistake for someone with two cars and a boat to think town centres close to PT nodes should cater for that kind of lifestyle. “The CBD parking maximums have probably had a huge effect in encouraging offices to develop elsewhere” – It is funny because half the anti-density advocates who come on here are always complaining about how all the companies have been “forced” to locate in the CBD. I suppose it depends on which suits your position. Personally, I dont think anyone is being “forced” to do anything. People make choices based on the current rules. The less rules, the more choice. Which is why we should do away with both urban boundaries and exclusionary zoning rules, but only at the same time as anything else would be social engineering. Or alternatively the Council could be honest and write some policies and objectives over the rules that fess up to the social engineering. Rather that saying maximum parking is to reduce travel demand have a policy saying their goal is to encourage those with lots of vehicles to live elsewhere. They could do the same with the zoning rules ie Objective 1 the Council wishes to make housing more scarce so as to push up prices. Policy 1 the council will reduce opportunitees both upwards and outwards. – I don’t see the market allocating parking well. My points were that there are many reasons for the ‘right’ outcome as you refer to it not to be achieved. Developers are incentivised to produce product that has maximised attributes – bigger/more is generally the key determinant in the market. This is not necessarily what buyers want, but is regarded as the highest value. I agree that the market allocates many things better than any centrally controlled system can, but let’s not kid ourselves; as you say markets are flawed in many ways, and lack of information is not the only issue. – While Council receives grant from CG, the utilisation of land does very directly affect Council income in the form of rates. My reference to ‘investment’ was also more than just PT – Council makes a wide range of investments from roads to libraries etc. I think it is right that these investments are made with a reasonably business-minded approach, looking for them to achieve maximum benefit, even if there are wider social outcome aspects that may modify this through use of grants. Ultimately, a Council that cannot be maintained by rates, direct business incomes and grants that are recycled from the income taxes generated by a city’s performance are unsustainable and we should not encourage that. Council has a very direct interest in encouraging efficient, productive land use for this reason. – Resident’s expectations of parking are more flexible than I think you give credit for. My personal anecdote is that I have rented an apartment and parking in central Auckland location separately, without any concerns or issues arising. It’s perfectly feasible. I also lived car-free in the UK for a number of years, renting vehicles at the weekends as required – great way to organised transport, and very low cost. I love driving (just not at peak hours) and drove loads of different models over the years – a drivers dream. [My tip – always turn up about an hour early – you often get an upgrade….] At the time I was a busy professional, visiting construction sites around the north of the UK on a weekly basis [work rental car, cheaper for them than providing me with a company vehicle], and I simply never needed to own a car. I accept that this will not suit all mobile workers, but you can see that it will suit some, and perhaps many. – to apply controls to landholdings that prevent the damaging outcomes of volume parking provision. By that I would mean rules around locating it away from street frontages, preventing excessive access widths across pavements, etc. – This would need to be matched by an understanding that roads in central areas would not be expected to be widened simply because large numbers of vehicles may want to access them. This expectation is probably one of the most damaging urban design issues of the past 60 years, with hugely negative economic, social, visual impacts, and usually with huge price tags as we are seeing with the proposed transport investment plans for Auckland. Once a settlement evolves to a certain degree of density, damaging investment in existing buildings and land uses just to accommodate speed and convenience of vehicle movement is counterproductive. If limiting road width and accepting congestion sorts where people chose to live, so be it – they are free to chose, and there are plenty of options for them. They also have choices to change behaviour (eg shift towards less dependency on vehicles) in order to stay where they are. Hi Tim. Just to clarify I am not a libertarian. The few libertarians I have met seemed to me to be dogmatic and cruel. My big view is that this country needs more jobs and higher paying jobs and more houses and cheaper houses. While not certain I am fairly sure that more rules from various branches of government isnt going to make any of those things happen. In the past we made the mistake of planning land use and transport separately. But now the mistake is to make land use subservient to transport. ie we want this transport outcome so here are the land use rules that will lead to it. Problem I have is I dont think it will work. People dont just fit in with the rules local government puts in front of them, instead they substitute to the next best answer available to them. I can’t build houses outside the MUL ok I will go to Pokeno and build them outside the jurisdiction. I can’t have parking in the cbd for the half my employees who want it, ok I will lease an office in South Auckland or Apollo Drive and do it there. People do this because they maximise to an extent that rules never keep up. Then there is the disconnect between cause and effect. The S32 work on parking maximums assumes a limit on parking will reduce travel. ok at first glance that makes sense if people dont have parking they might not have a car so they cant drive. But go deeper and look specifically at residential and I dont think so. I live in a house where we have two cars because sometimes we go in different directions, it was hard when we only had one car. I work at home and my wife walks to work but we still find it useful to have two cars because when we need them we need them. We have a daughter who wants to drive but neither of us are keen to let her in our car so we will soon buy a third one. But even then out traffic generation rate will still be lower than the RTA book rate, the ITE rate or NZTA report 453 (and our carbon emissions lower than the Kyoto year 1990 when we commuted). We have lived in London with no car and with one car, we have lived here with no car, one car and two. The choices available and the life you get is so much better and easier with at least one car. Of course there must be diminishing marginal utility to cars. the trick is to finding ways to deal with the external costs they create. I am quite sure that needn’t involve removing choice. no one here defending maximums. However the only choice being restricted is if Minimum Parking Requirements are in force. Parking is one thing that developers are scared of under providing. Also the removal of Minimums is being done in the context of major public transport investment, so more households will be able to get by with one less car. This plan won’t be on force until 2016 at the earliest, but by that stage public transport will have hugely improved through the new frequent bus network, electrification giving 10 minute all day frequencies and quicker trips, integration of fares, integration of all modes. Then over the 10 years of the plan things will continue to improve with City Rail Link, new busways in North, North-West and South East, rail to the airport and Mt Roskill. Just look at the pace of change, and massive rise of inner city and car free living in the last decade. This trend will continue so we should plan for the trend, not the past or the current. There’s a very good case for maximums (of zero) – in the places that currently have a zero maximum. The town centre and city centre retail frontages. Offsite parking itself isn’t really an issue that affects others, but there’s no way to get in or out except with a vehicle crossing, and those are detrimental to highly pedestrianised areas. When we talk about “choice” – it’s not just about individual choice for a single site. It’s about the sorts of total neighbourhoods that are offered. We have lots of purely suburban residential zones that provide for people who don’t want the hustle and bustle of genuine urban life. That’s great. The problem is, there’s far too much of it. There’s very little provision for people who’d like to live in a more urban, less car-dominated place. If you insist on a certain definition of choice that says everyone can do everything on every single site – well, that’s a valid approach. But it’s hypocritical to apply that property-rights-uber-alles idea selectively. You want to be able to put huge loads of parking in town centres, citing individual choice. That doesn’t give you much philosophical basis to argue against someone, say, setting up a nightclub in your residential street. John @3:37. I’m fully in agreement with you on so many of those points. Planning needs to be far more driven by understanding and guiding real life behaviours rather than theoretical constructs and legal technicalities. As Luke @3:55 says, I still believe there is far more appetite for and enabling of change than we have yet seen happen; but the first step in moving towards the future involves recognising where we are now. Any proposed rule needs to think through the broad, interconnected range of behavioural consequences. Thanks Lynne, Luke and Nick missed your point completely. Changes to the current rules impact negatively on the character of Auckland’s heritage areas, because it directly results in increased parking congestion in the fringe areas, whilst PT remains a high cost and low service alternative. I support maintaining the current MPR to protect the heritage areas and their residents from increased congestion. Any analysis needs to make a proper distinctions between resident parking and commuter parking. Without this differentiation any economic analysis of the impacts from a parking strategy will remain flawed. Shroup recognised the distinction between the two drivers but didn’t articulate it well, partly as a consequence of this failure to separate the two drivers, current strategies are compromised. Furthermore, the American research is not easily translated to the NZ situation hence the flawed MPR recommendations in the UP. There are no easy answers but AT needs to get the basics right when conducting its region wide review. Isn’t that where we got MPR’s from? Secondly, since when did ‘parking congestion’ impact the CHARACTER of heritage areas? If we follow thar argument through we end up with unpaved streets and horse drawn vehicles only. Really? If there is an issue of workers filling streets near employment areas with traffic then two observations flow; one, parking control is the best solution; two, it is a result if location just as the heritage character benefit is. Residents need to accept that location brings various benefits and drawbacks, and they should not expect to be entirely shielded from all ills in life – and they certainly should not expect the solution to be borne on others shoulders. If tiger is an issue of access for locals then parking control is the solution. The true character of heritage areas. http://www.teara.govt.nz/en/photograph/24430/night-soil-man It really was a sustainable solution! Grey, How on earth do MPR’s protect heritage? “I support maintaining the current MPR to protect the heritage areas and their residents from increased congestion.” Very peculiar statement. Are heritage buildings damaged by congestion? Or is it really the second half of that sentence that matters to you? With MPRs you will still get more neighbours, but they will be certain to be drivers, leading directly to more congestion. MPRs enforce increased congestion. Parking leads to driving. If parking is mandated into new builds they will be much more likely to be occupied by people with cars. These cars will be driven leading to higher congestion for you. Allowing apartments to be built with no or less parking is the only way that there will be new residents that drive less. The heritage issue is red herring here, MPRs are entirely unrelated to heritage, but also it seems that that isn’t your actual concern; you just want less congestion. Don’t we all. If it really is heritage that you are passionate about, then heritage controls are what you should be concentrating on. Saw you boys in action yesterday at the Auckland Transport Board meeting in Henderson. Absolutely love your desire to improve Public Transport. I congratulated you at the meeting, said I supported you, and thanked you. I love your Public Transport vision. I went on your website today, and was so sorry to see that you support zero parking minimums. I was also sorry to read some of the blog comments. I live in Freeman’s Bay, and my friends, neighbours and myself ,are effected by non resident parking every day.. Here are some of my observations on this. The reason I am writing this blog is to put a bit of a human aspect to this. I felt reading some of your blogs that some think it is inappropriate for anyone to own a vehicle if they live in an inner city suburb. It is made up of a wide range of people. Some families have lived here in the same house for more than one generation. Some of my neighbours have lived here for over 40 years. Many of the neighbours are elderly. We have families and couples. We also have renters, they usually have 4 cars per dwelling. I have lived in the area for over 20 years. I liked what I saw when I came here, that is why I bought here. I am now seeing angry frustrated residents. They are angry at the parking issues that they face daily. If you don’t believe me, you are welcome to come to the Freeman’s Bay Residence Association meetings to hear it first hand. The Association which has 180 residents registered in its database, was formed 3 months ago. One of the driving reasons for the formation, was that people wanted a means to sort out the parking issues. We had 90 people turn up for the first meeting, and a staggering 109 turn up a couple of weeks ago to a working group meeting. Such is the frustration regarding parking. A lot of houses do not have off street parking. The option to raise a dwelling and put parking under the house is simply beyond the financial means for some, especially pensioners. It would also drastically effect the very character of the suburb that Auckland Council and the residence have worked hard to maintain. I would like to offer a couple of examples of the difficulty of not having on street residential parking. The first instance is a mother living on Franklin Road. She finishes her work (not on a public Transport route), buys the groceries, picks up her young children from school and looks for a car park. None outside the house, so tries to find a park on her street. No such luck, so eventually, she finds a park a couple of streets over. In the rain, she walks with her children and the shopping home. Yes, I know what you will say, she should not live here. But this is a family neighbourhood. The second example is an elderly neighbour of mine who has no off street parking, goes out for the day in her car, and returns, and has to park several streets away as the street is full of commuter’s cars. Once the commuters have driven home for the night, she can retrieve her car. This is not a normal way to live in a suburb. This is not the result of a well thought out transport plan. Suggesting she lives elsewhere, so that a car less person can buy her house, is not really the answer either. I am a self employed contractor. My work takes me as far north as Warkworth, and to the eastern, western and southern areas of Auckland. Public transport does not work for me. I need a vehicle. The reality is that most people have a least one car per family. A lot of people play sport at night. Public Transport is not available for a lot of sports areas, and also not available to get them home after sport. I like to go to Regional Parks. I can not find public transport that would take my wife and I, and our gear for the day to any of the regional parks. Auckland Transport has not yet surveyed commuters. I talk to commuters so I can understand their issues. Commuters use cars to commute to town because current public transport does not work for then. In some cases they believe it is cheaper to use vehicles. We are now seeing people who live in the CBD “garaging” their cars on our streets for long periods. This is cheaper than paying for parking near their apartments. This does not remove their requirement for parking, it just moves it to become “someone elses problem. New development currently under construction will create at least 50 more cars parking on streets. On the corner of College Hill and England Street is a new 36 apartment block and office complex. It boarders on a Res 1 zone. At night there should be 34 car parks available on site. This I am led to believe will not be the case. The apartments are to be kept under one ownership and the apartments are to be rented. The car parks will not go with the apartments, but will be rented commercially. The tenants will have no choice if they wish to have a vehicle, but to park them on the heavily congested street. Another future development in Spring Street will be for a minimum of 80 apartments. With what you are supporting, there is no requirement to provide parking. This could create approximately 120 additional cars on the streets around Freeman’s Bay. Seriously, where will they physically park. I do not know. By supporting a zero parking policy, you are proposing major changes to people lives. So come and meet them, to understand the effect you will have on them. 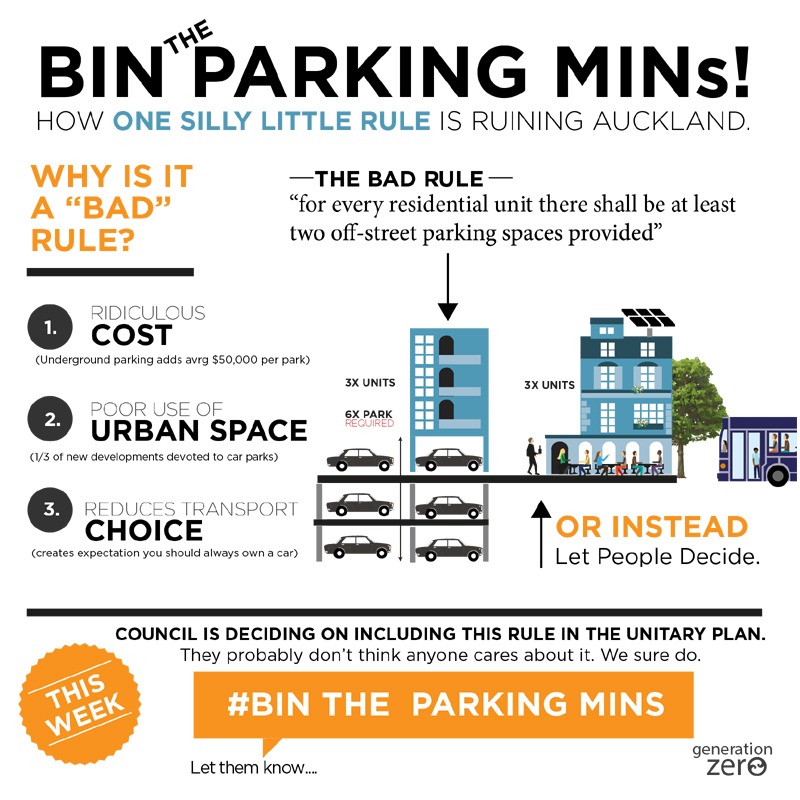 Remove your support for zero minimum parking rules. Supporting zero parking is an ambulance at the bottom of the cliff mentality. It simply adds more parked cars on the streets. Stop the problem at the source. Continue your wonderful work to create better Public Transport. Prove and then communicate to commuters that it is cheaper to use Public Transport than drive. Promote that fact. Hi Trevor. Great to hear from someone who believes in their neighbourhood and community, and who supports public transport improvements; but I am afraid I have a few blunt questions to ask. Please don’t take these as an offensive against you or anyone in your area personally, but I think some important issues of equity and entitlement sit underneath your requests. I am genuinely listening to hear how you reconcile them, so do please reply. Are you saying that people who live in the area already have a right to a free on street park while new residents do not? Do residents of new developments have to pay for on site spaces when you did not? Are you saying that a publicly owned street cannot be used by others during the time that residents are away from their house? Full disclosure: I own a car, have kids, live in Auckland and see other people come and park on my street. I do have a driveway and garage, but would happily trade them if I could afford to live in walking distance of the CBD. Hi Trevor, sounds like the main problem is that there’s a lot of demand for parking in Freeman’s Bay. There’s two possible ways to deal with “excess demand”. The first is to increase supply, ala minimum parking requirements. The second is to reduce demand, usually through pricing parking and/or investing in alternatives, such as public transport. While minimum parking requirements are effective at increasing the supply of parking, research both here and overseas (I can provide you with links if you are interested) has shown that they have a range of negative consequences. The most notable of which is more expensive housing, and I’d suggest that housing is more important than transport. So, on balance, the negative impacts of minimum parking requirements seem to outweigh their positive impacts. In contrast, reducing demand by a combination of pricing and investing in alternatives seems to have very few negative consequences. Sure, a few people will have to pay more for parking, but even those people will benefit from being able to find a car-park more easily, as will their visitors. And of course pricing parking, while investing in alternatives, are complementary initiatives insofar as they support each other. I agree that the problem you identify (i.e. excess demand for parking) is very real. Where I, and indeed others on this blog, tend to disagree is with your proposed *solution*. To put it simply, increasing the supply of parking through enforcing minimum parking requirements on new developments, as you advocate, will make us less well off as a society. The costs of your solution outweigh its benefits. Hi Trevor, does your association have a website with contact details? Would be keen to be in contact further about this. The context of opposing parking minimum’s is the planned major investment in public transport and cycling, which will make it easier to get around the city without a vehicle. I’m sure many people who commute and park in your suburb come from areas with very poor public transport. As this is improving quickly we should start to see more options for people who park in inner suburbs and public transport will be much more attractive to them. At the same time the latest census shows 25% of people in Waitemata are living without a car. We know that many people need a car for a variety of reasons, and that will always be the case. The CBD has no parking minimums, but most apartments and offices still provide the option for parking. Its just that they can alter the number of parks depending on the demographic they are attracting. The apartments being built in Freemans Bay are likely to be very high end, so would expect most or all apartments would still contain parking, and thats fine. Hi Trevor. I have been working in the transport field for 27 years and the views you expressed are exactly what I have heard from many communities where housing was built before people commonly owned cars. Your best bet is to make a submission on the Unitary Plan but it has to be in no later than tomorrow. http://www.aucklandcouncil.govt.nz/EN/planspoliciesprojects/plansstrategies/unitaryplan/Pages/makeasubmission.aspx It is important that the people deciding these things see a full range of views and not just those who want to change things. Even if you can sometimes use public transport or walk you will probably still want a car and so will your neighbours. Parking SPACE is a three-dimensional area. My main mode to transport is Bicycle. But this does not stop me from having 4 cars and a boat parked on my property, I have SPACE. Successful city parking SPACE policy has nothing to do with increasing or decreasing parking supply. It is about knowing the different between public SPACE (the street) and private property (storage SPACE for your car). What you are talking about is normal all around the world. Good examples of parking policy can be found in the car loving cities of Germany and Japan. Hi TimR, good questions and no offence taken. I appreciated your opening paragraph. Thank you. So, to answer question 1, in 2 parts. a) I think new or old resident’s have the same rights. and b) I think going forward residence will have to pay an annual resident parking fee. Question 2: The price I paid for my house reflected the fact it had a garage for one car. So yes, I paid for my parking space. We park one in the garage, and the other on the street. (My wife is also a contract consultant and has found current public transport unavailable for some of her work locations). I think any new development or single dwelling being constructed should have “some” parking off road, hence my opposition to zero parking requirements. I do not expect new developments to provide full off street parking, but expect them to provide at least 1 per dwelling, more depending on the number of bedrooms per dwelling. As an FYI, I am considering spending up to $100,000 to extend the garage under the house to provide a second car park. This is serious money to me, and when I bought here I never thought I would be paying these amounts for garaging. Further FYI, both valuers, and real estate agents place a value of approx $70,000 for covered car parking in the Freeman’s Bay/Ponsonby area. So, yes, when you buy a residence now, you are paying for parking as it is reflected in the sales price. Question 3: No, I am not saying that, nor would I suggest it. I do not have an answer to my neighbour’s problem. The reason I described some of the issues resident’s face, was for people to be reminded that we are communities and need to be mindful of each other. I try to do my bit by being helpful to commuters. TimR, happy to answer more questions tomorrow. Hi Trevor, thanks for your responses. I fully agree with you that we all need to be mindful of peoples needs and respectful of communities. This is sometimes lost when discussing issues such as planning and transport; while these are essentially about serving people it’s easy to depersonalise them into a technical discussion. In a similar vein I also have to say that I disagree with Lynne’s suggestion that there is any sort of conspiracy to push people out of the neighbourhood. No one is advocating that; what (I think) Gen Zero represents is the need to see that change is both normal and necessary in response to both social and environmental conditions. Personally I could not live in a community that did not change, but I fully understand that others do not share that view and struggle with accepting change. For me the real question is how to embrace change while helping people transition, bringing communities through such processes in a good way. I think there are good, balanced ways to deal with the kind if challenges you raise. The way you answer makes me think you see and respect that route already, and I in return respect that you take responsibility for dealing with changed circumstance: building a solution so that you can keep your business vehicles and stay in the same house. That’s a great outcome, even if it comes with a high cost. Stu and Peter have talked about why and how other choices operate, and for other people there might be better solutions. Responding more to Lynne now: the reality is that all communities have to deal with change in one form or another. If we all assume a right to everything staying as it was around us I suggest we would stagnate as people and as a city. It’s normal to grow old, for young to replace old. It’s normal that attitudes to transport and housing change : I doubt Lynne has the preferences previous generations had in these areas. When it comes to resolving this in urban settings it comes down to an art of balance and compromise. There simply is not room for catering to every preference and getting a good environment as an outcome. Everyone knows there is limited street parking in older CBD fringe areas, but not everyone wants to depend on a car, especially in such central, walkable areas. In my families experience this applies to older people even more than it does to younger, as so many lose the ability to drive at some point. And it’s worth respecting that other people will see things differently to you in this way. Lynne – no one is forcing you from your home through the Unitary Plan; equally, planning would not exist if the status quo were naturally to continue. Good planning is simply the art of good change. The arguments here are not taking account of the current very limited on street parking in Freemans Bay which cannot accommodate more cars from apartment buildings yet to be built (or being built). Many houses do not have sufficient land available to create off street parking and owners cant necessarily afford it (not everyone is an affluent baby boomer). But what I’m really wondering ……..when did everyone decide that living in Freemans Bay was only for young, mobile people. We have large amounts of social housing in the area, many elderly residents and also many residents who have been here 30, 40, 50 years. They park on the street. Are you suggesting they all need to relocate? No, we’re suggesting that existing residents have no more right to onstreet parking than new residents. It’s a public resource, after all. That means that a perceived shortage of parking is not a valid reason to lumber new development with responsibility for providing parking. Instead you should find means of managing the demand for parking in line with the available supply = prices, and let residents (old and new) decide whether they want to pay for offstreet/onstreet parking. P.s. Price signals don’t just manage demand – they incentivise supply. So once onstreet/public parking is priced private developers and residents have an incentive to provide/procure parking to meet their needs. In this instance price signals really do work. They are clearly the best solution. For the Freemans Bay residents my suggestion is to lobby for a residents parking scheme the same as St Marys Bay Residents association is asking for/already have. This means that **some** – not all – on-street parking is reserved for local residents to use (for a annual price per car). A permit is needed to park in these streets. I think 1-2 permits per property is more than enough and I think they are reasonably priced as well, when the true cost of a “guaranteed” (off-street) park in Freemans bay is $70K as per Trevors’ comments. So really, on that basis, the on-street ones shouldn’t be free either – and in fact should be charged out at $1000 per car park per annum in my opinion. However, the Auckland council does not charge anywhere near that for the annual permits that I’ve heard of. I also think that residents with 3+ cars per property can work out for themselves how they want to manage it. My suggestion is that they either rent someone elses off-street park or consider other options – usually involving paying something to someone. The streets are a public resource, so should be managed as such, not a private free-for-all – no matter how long you have or have not lived there. Residents parking schemes are a free-market distortion, but they do send (price) signals to everyone – including all those out of zone parkers – which Trevor indicates are a big part of the problem – particularly that they should find elsewhere to park – like the many parking buildings in the CBD perhaps, or use PT. Why not take a more flexible approach to parking permits? Why limit them to residents? Instead, I’d suggest you make them available to anyone and simply charge a price that reflects their value. Of course, residents are willing to pay far far more than your average commuter.